Haus Sunrise Offering free Wi-Fi and a ski storage room, Haus Sunrise is located in Zermatt, 400 metres from the Zermatt Ski Area and the Matterhorn Glacier Paradise. Anita Anita offers self-catering accommodation units with free WiFi access, located in Zermatt, 100 metres from the Matterhorn Glacier Paradise Cable Car Station and 200 metres from the Ski Lift Zermatt - Furi. The bathroom comes with a shower or bath tub and hairdryer..
Haus Leopold This typical Swiss chalet enjoys a quiet location only a 4-minute walk from the Klein Matterhorn Cable Car and a 15-minute walk from the centre of Zermatt. The apartments have a balcony with Matterhorn views. There is also a shared ski storage room and boot storing and drying facilities..
Haus Floralp Situated in Zermatt, 600 metres from the Sunegga and Matterhorn Paradise Ski Lifts, Haus Floralp offers self-catering accommodations with free WiFi and a ski storage room. An ideal view of the Matterhorn Mountain can be enjoyed only 100 metres away. In addition, they feature a living area with a sofa and a bathroom with both a shower and a bathtub..
Hotel Kronig Just 100 metres from Klein Matterhorn Cable Car, the family-run Hotel Kronig is a 15-minute walk from Zermatt Train Station. A sauna, steam bath, sun bed, and fitness room are available. Hotel Astoria Located in the centre of Zermatt, Hotel Astoria offers spacious rooms, free WiFi, and access to a wellness area for surcharge. During the winter season, you can book half-board for a supplement. Right next to the Astoria Hotel, there is a lively bar, a small supermarket, a bakery, and several sports shops and restaurants..
Casa Della Vita price per day from € 237 A 15-minute walk from the centre of Zermatt, these large and modern apartments enjoy a quiet location in the Winkelmatten district. A ski storage room with a ski boot dryer is also available. A ski bus stop and a grocery store are a 5-minute walk from the Casa Della Vita Apartments..
Alpenlodge price per day from € 98 The ski-in Alpenlodge is located on a sunny slope on the edge of Zermatt, offering panoramic views of the Matterhorn and free access to the wellness area. Guests can enjoy stunning views from the relaxation room over the surrounding mountains. The Sunneggabahn cable car and the buses to the Matterhorn cable cars are only a 5-minute walk away from the Alpenlodge..
Chalet Achat price per day from € 78 Located in a quiet yet central area in Zermatt, 900 metres from Zermatt Train Station, Chalet Achat offers an on-site ski school, free ski storage and a view of the Matterhorn. Various restaurants can be reached within 50 metres from the property, while several shops are 100 metres away.. The location of Zermatt at the base of the Matterhorn and in the middle of a large hiking and ski province makes it one of the Europe's most alluring family vacation villages. The ski region encircles more than 360 kilometers of pistes. The province is legendary amongst mountaineers: the Haute Route, a demanding international route that takes a couple of days to complete, leads from Mont Blanc to Zermatt. More than 400 kilometers of treking paths lead through the Matter Valley, including the mule traders' paths, which date back to the 13th century (a part of these paths is paved). In winter months, the snow-assured ski province features more than 360 kilometers of pistes in three varied ski areas: the Sunnegga-Rothorn, Gornergrat-Stockhorn, Schwarzsee and Matterhorn glacier heaven. Snowboarders and Freestyler are able to hone their skills in the Snowpark Zermatt in which Olympic hopefuls as well train. With sights over a couple of the most awe-inspiring scenery in Valais, holiday accommodation in Zermatt can be found in the shade of the mighty Matterhorn, a mountain of such beauty that there couldn't be a number of other landmarks to provoke similar feelings of awe and wonder anywhere else in the Swiss Alps. 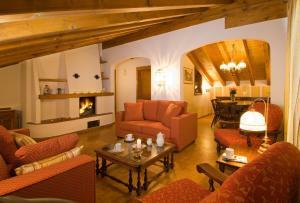 Cozy mountain chalets and holiday apartments in Zermatt are the perfect choice. The river Vispa runs right through Zermatt and there are three prime roads which run along the banks of the river Vispa, and innumerable cross-streets, particularly around the station and the church which forms the heart of the village. In general anything is at most a twenty minute walk away if you are fit. During the course of the summer there are roads and treking paths leading up to a variety of year-round eating places in the direction of the Matterhorn. Zermatt is an exceptional place to mountain bike. Bicycles can be hired from a couple of stores around Zermatt from roughly 40CHF for a hard tail and 50CHF for a full suspension daily downhill rigs are 100CHF per day and helmets are included. If you're on a budget, try camping in Zermatt. The atmospheric conditions are gentle, even in the winter months, so if you know a bit about camping you should be able to stay warm and dry at pretty much any altitude lower than about 500 meters above the village. For beginner campers there is a camping area open in Zermatt during the course of the summer. Skiing in Zermatt is split up into four areas: Schwarzsee, Gornergrat, Klein Matterhorn and Sunnegga. There is as well a connection to Cervinia and Valtournenche in Italy through the Plateau Rosa glacier. Winter months are naturally a cold time to be staying in Zermatt. Monthly temperature levels average around 0 Celsius from the end of December till late February, but then early spring arrives. With early spring, temperature levels soar, and by late April, you can be relaxing in daily temperature levels of around 20C. During the course of summer months, temperature levels can reach practically 30C in the heat of the day, making trekking, climbing or mountain biking an even greater pleasure. 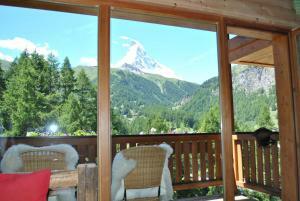 Reaching a holiday accommodation in Zermatt from the UK is simple. There are frequent air travels to Zurich International airport from London, Birmingham and Manchester, offered by Swiss International Airlines. From the air-port, there is a train that operates straight from Zurich International airport to Zermatt taking just 60-70 minutes. 51. At the roundabout, take the 1st exit and stay on Kantonstrasse. 54. At the roundabout, take the 2nd exit onto Grächenstrasse. 56. At the roundabout, take the 2nd exit onto Talstrasse. 59. Continue straight onto Breitmatten. 65. Continue onto Neue Kantonsstrasse. 66. At the roundabout, continue straight to stay on Neue Kantonsstrasse. 67. Turn right at Margritli. 68. Continue straight onto Kantonsstrasse. Ski resort Adelboden, number of cross country pistes: 86km. 53 km from town of Zermatt. Ski resort Adelboden-Lenk, number of ski pistes: 176. 53 km from town of Zermatt. Ski resort Aeschi, number of ski pistes: 8. 71 km from town of Zermatt.